(1 Customer Reviews) | Write Review 4 issues per year Coin Collector gives you all the information, news, expert advice, market insight and inspiration you need to build your coin collection and get the most from your hobby. 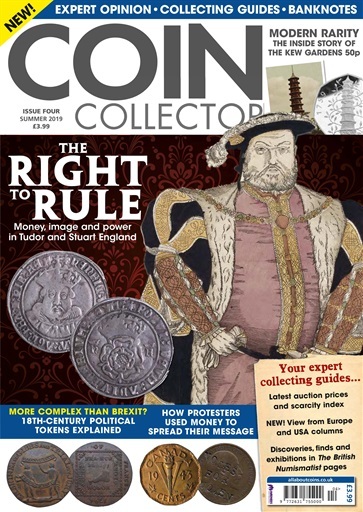 Every issue features in-depth collecting guides giving you the lowdown on coins from a wide range of periods and location, from Viking and Roman coins to the latest coins issued by mints around the world. Each issue includes the unique and popular ‘British Numismatist’ section, bringing you the latest discoveries, exhibitions, theories and literature from the academic world of numismatics. Written by authors, curators and learned experts, the pages provide an academic yet still accessible take on the hobby. The popular Market Insight pages give you the latest prices, auction advice, tips from the traders themselves, giving you the info you need to buy and sell with confidence. With articles on banknotes, tokens, new coins, and much more, Coin Collector is fast becoming the go-to resource for collectors around the world. Coin Collector gives you all the information, news, expert advice, market insight and inspiration you need to build your coin collection and get the most from your hobby. Every issue of Coin Collector celebrates the incredible hobby and brings you friendly, accessible information and advice, to suit every level and every budget. Join the Coin Collector community today and take your collecting to the next level. You'll receive 4 issues during a 1 year Coin Collector magazine subscription. A really great format and good mixed content - really intereesting coin features from all corners of the globe. Recommended. You'll receive 4 issues during a 1 year Coin Collector magazine print subscription. Issue 2 - bigger and better!